At my house, there are two definitions of August. To me, August = Tomatoes. To the other resident (husband Howard), August = Corn. Selections for the first two weeks of French Fridays with Dorie were perfect. Tomato-Cheese Tartlets the first week, and Warm Scallop Salad with Basil, Tomato, and Corn. I missed last week’s deadline for the tartlets, but made both this week. The tartlets were fun to make. The individual tarts were constructed on disks of puff pastry. I had a little trouble with the puff pastry. The package said you could defrost at broom temperature for 20 minutes or microwave for 90 seconds. I went with the quicker approach, but turned on the microwave and walked away. It got a little too soft and wouldn’t unfold. I just rolled it out with the folds making extra layers, but I had some tearing that didn’t mend as forgivingly as pie crust. 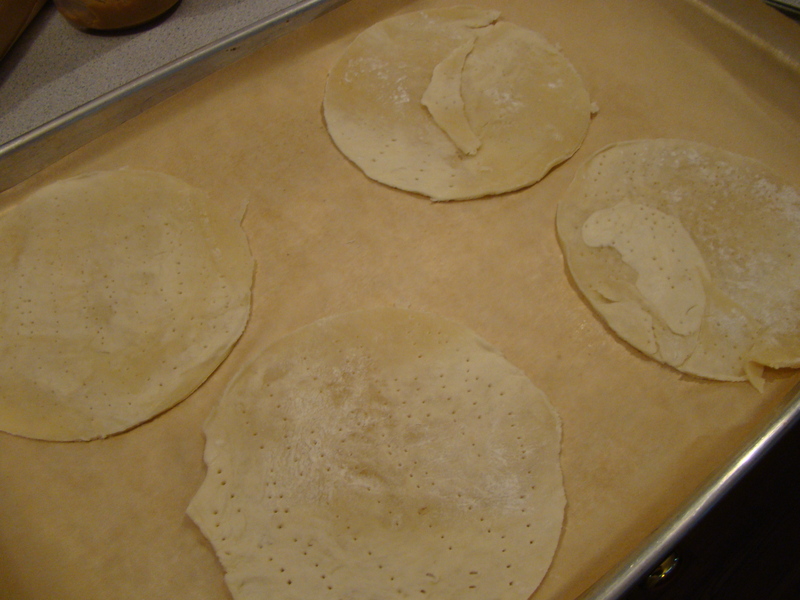 But I liked the simplicity of cutting out circles and baking until lightly golden. As with many of Dorie’s recipes, this one was more of a suggestion than a strict recipe. 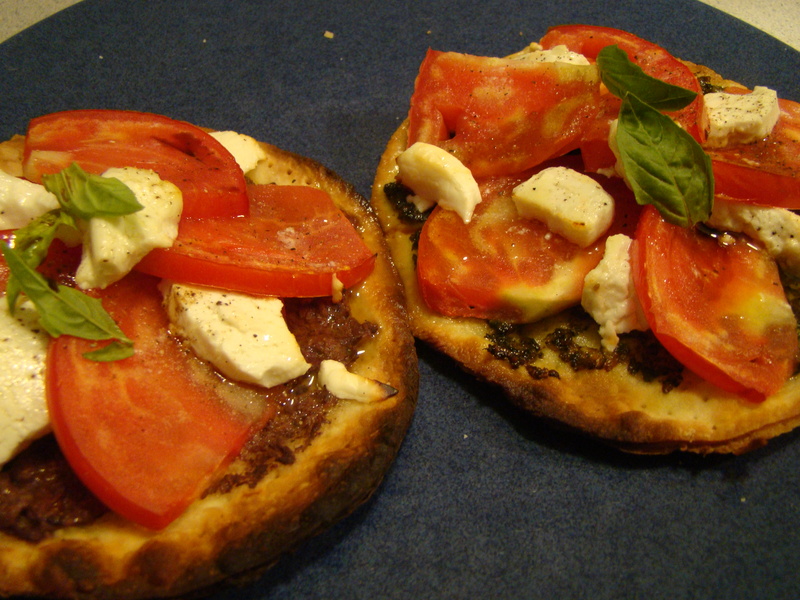 The disks were smeared with a layer of tapenade or pesto. I tried two of each. This is topped with alternating slices of tomatoes and cheese, goat cheese for me. I warmed the tartlets under the broiler for a few minutes until the cheese started to melt. A final drizzle of olive oil, balsamic vinegar, and a fresh basil leaf garnish and it was done. We each ate two of these for dinner, but one tart accompanied with a salad would have made a lovely lunch. Sipping a glass of cold white wine on the side is the perfect accompaniment. The warm scallop salad was another summer treat. The scallops were a bit pricey, but worth it for the end result. I left out the nectarines, but the lightly dressed corn, freshly picked backyard cherry tomatoes, and fresh basil coulis were packed with flavor. The vegetables surrounded the seared scallops which were the star in the center of the plate. Each component was super simple to put together, now that I’ve learned from several Dorie recipes how foolproof it is to pan-sear scallops. I could make this for a weeknight dinner after a long day at work. The final dish was restaurant worthy. All-in-all, it was a good week for enjoying new recipes spotlighting seasonal ingredients. Recipes aren’t posted, but are available in Dorie Greenspan’s book Around My French Table. To read about other home cooks’ experiences with these recipes, check out the Leave Your Link posts at French Fridays with Dorie. 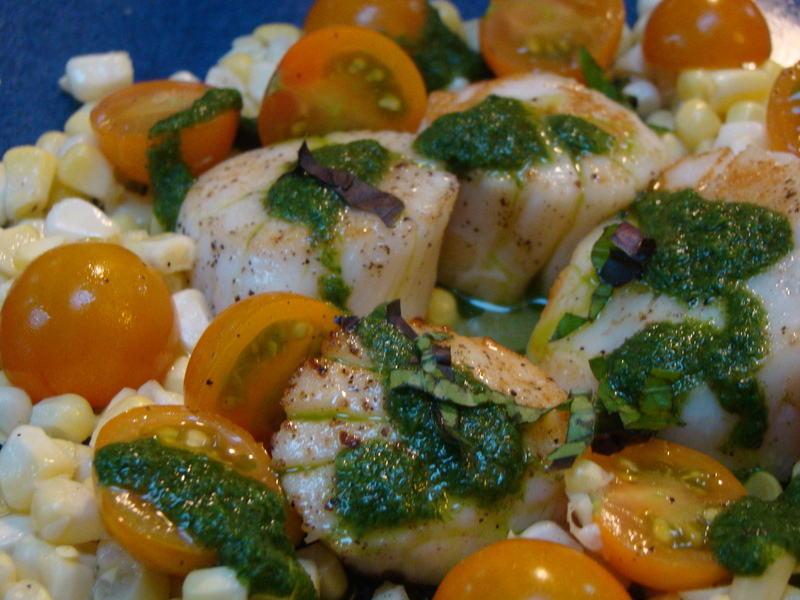 Posted on 10 August 2012, in French Fridays with Dorie, Summer and tagged basil, corn, French Fridays with Dorie, scallops, tomatoes. Bookmark the permalink. 17 Comments. I must admit, I am on team corn. It has been fun working with seasonal ingredients this summer. Yummo! Both dishes look terrific. Your dishes look delicious:) It is soo nice to have great recipes that use seasonal produce. Have a great weekend! I didn’t layer the basil sauce over the scallops they way you did. I got lazy and mixed it all together. It looks fabulous. Wow, Betsy, you made everything look so good that I want to make it all again! Restaurant worthy indeed. So good I had it two nights in a row! Beautiful. I enjoyed both these recipes, though I was originally a little skeptical about the tartlets. I love being able to use in season vegetables in our recipes and I agree that the first two were perfectly timed. I was able to use my own basil for this recipe, but my tomatoes are still green – our summer has been so cool that they’re only starting to take off now. Thanks for posting your double-header. I liked the tartlets and it was fun to make them with my grandchild (9) even if she couldn’t understand why we didn’t let “puff” pastry “puff”. And, you’re right, it was all about the technique and idea-of-it this week. This tartlet can be served so many different ways. I am glad you enjoyed the scallop salad. I liked everything about the salad but the scallops which I can’t eat. Scallops and I had a real falling-out one night and I’ve never returned. Food poisoning cures you for a food forever, I’m afraid. Agreed, some real summer hits the past few weeks. I just got around to the scallops last night so I will post them this coming week. Liked them, but really loved the tarts, those are my favorites so far this month. Yum! These two dishes sound perfect together! I am dying to eat scallops again after reading everyone’s posts! Betsy, Both of your dishes look wonderfully delicious! I loved the tartlets and I can’t wait to make the Scallop salad. I was at my daughters for the weekend and the food was kid friendly. On the way home, I bought my scallops and plan on making this tonight for dinner…for me, this week will be Mondays with Dorie! The scallops were very pricey…glad to know this salad is worth it!! The golden cherry tomatoes are so pretty on the scallop salad. Glad you enjoyed these dishes. Restaurant worthy indeed! Your dish looks great even without the nectarines. Yum! Both of them look really good. I skipped the tarts, but I may have to revisit them sometime soon. Great photo of the scallop salad! I don’t think I could choose between summer tomatoes and corn. They are definitely two of my favorites.